Kantar-GeoPoll Media Measurement (KGMM) collects overnight data on audience size, ratings, and share for TV and radio, 365 days a year. KGMM uses a 4-hour recall mobile survey methodology to produce the most accurate diary data available in many African countries. This report includes KGMM data for the top TV stations in Uganda over a 3-month period, from July 1 – September 30, 2015. You can view more KGMM audience measurement data and filter it by location and demographics by registering for an account here. 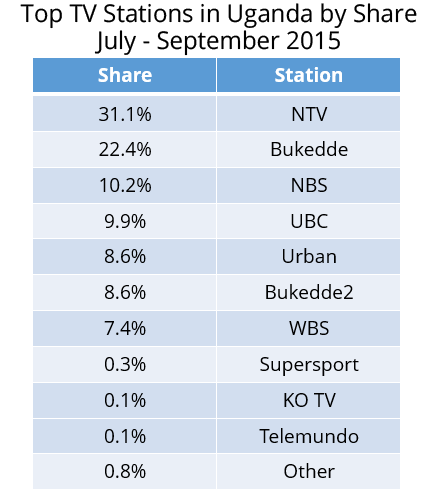 Below is a chart showing the top 10 stations in Uganda by audience share. As in the last quarter, NTV is the clear leader in audience share, followed by Bukkede, which dropped in share by 5%. UBC and NBS, which were ranked third and fourth respectively last quarter, have switched positions with NBS overtaking UBC, although the two stations remain very close in audience share. We observed several differences in ratings for male and female viewers from July to September. For example, Bukkede has higher ratings among females, who generally tune in after 20:30. Bukkede’s overall share is also higher with females, with a share of 26% among females compared to just 17% among males. NTV is popular with both males and females, with a share of 33% among males and 29% among females. KGMM is available on a subscription basis in Uganda and a free version of KGMM is currently available exclusively to Ugandan broadcasters. Click below to register for an account using referral code “UGANDA” and a GeoPoll representative will contact you shortly to activate your account. *Rating is the proportion watching a station out of the total sample at that time, multiplied by 100. If 50 people out of 500 surveyed watched Station X, the rating for Station X would be (50/500)*100) = 10. In Uganda, KGMM includes a sample of over 500 respondents for every time period.